This is the most popular recipe on my site and it’s no wonder why, it really is the Best Banana Bread! *Note- this recipe is by far the most popular on my blog so as of 11/11/16 I’m updating the photos a bit. The recipe hasn’t changed- it’s still perfect! I will say that I’ve made it with whole wheat pastry flour with wonderful results, as well as with half or all coconut sugar replacing the white and brown. Mini chocolate chips are a wonderful addition (I did a cup,) and you can bake this in an 8×8 square pan if you want to make more of a snack cake. (I’d just bake it for about 20-25 minutes instead!) Thanks for loving this as much as I do! I wasn’t going to share this recipe. Even though I have honest to goodness baked no less than 6 loaves of this in the last 3 weeks, it just didn’t seem blog-worthy. Not because it isn’t fabulous (it truly is the BEST Banana Bread Ever,) but because it just seemed a little too boring and I honestly didn’t think anyone needs another banana bread recipe. This recipe is easy as can be, one bowl, and comes out perfectly every time. 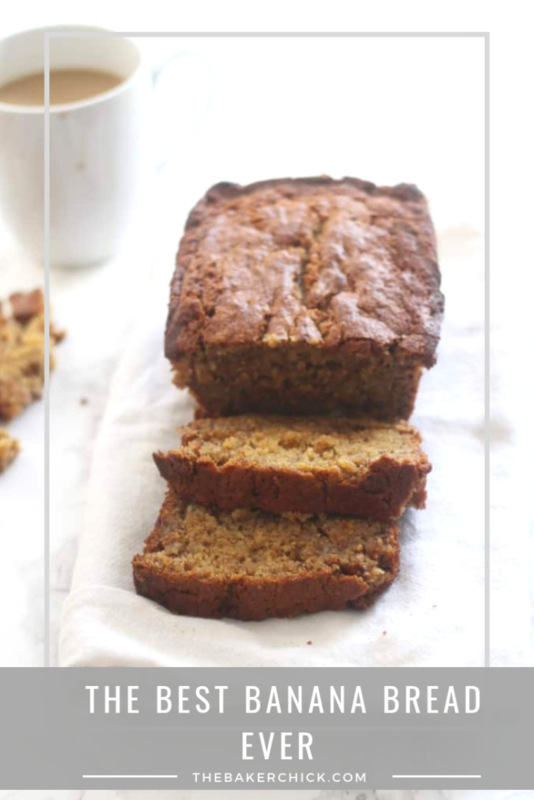 It is the most moist, flavorful, melt-in-your mouth banana bread and I just adore it. So much so that I cannot have it in the house anymore because I’m addicted. If you love this recipe, you have to try my Easy One-bowl Pumpkin Bread which is just and easy and amazing. Also- did you know you can bake this recipe in jars to make for the cutest and yummiest gifts?? The best banana bread ever, this recipe is super easy, adaptable, and delivers great results every time! There is ALWAYS room for more banana bread recipes. I love trying all the different iterations. Could you please add the oven temp and pan size you used? Hah, I’m sure I could have figured it out, but yes very helpful. :) Can’t wait to try this with my spotty bananas. This recipe is so easy and delicious! I made small loaves for giveaways and people are still calling me to say how yummy it was. BREAD I WILL KEEP FOREVER. Keeping it forever is not recommended. You should make a fresh batch every now and then. I have used this recipeabout 10+ times. This is the ideal base. This recipe is a bit too sweet and gummy for me but everyone else loves it. So, I made them 1 and modify the 1 I make for myself. Adding cinnamon gives it a lil’ kick. Agree with your opinion. Little gummy but awesome pure banana bread flavor. I think what helps this bread is there’s no baking powder flavor detracting from the other ingredients. I totally encourage the addition of cinnamon also. This overflowed in my 8×4 loaf pan. I had the same issue. My kitchen was smoky for days. Not sure what I did wrong. I tried your banana bread recipe today and it is very good and I messed up I thought my measuring cup said one half and it was a two thirds cup oh well I had used it for all my measurements so everything came out fine.Thank you very much for the recipe I am putting it in my recipe file to use again my only thing I added was a teaspoon of cinnamon.i always add cinnamon to my banana bread.Thanks again Colleen Becker. This has all the right stuff, so I can definitely see why it’s the best! Yum! we want! we want! this looks delish and you sold it very well in the last paragraph. I can’t wait to try this recipe. thx for sharing!!!! There must be something in the air… I, too have made several loaves of banana bread this week using a very similar recipe. For an added surprise I sprinkle a tablespoon of coarse sugar(turbinado or granulated cane sugar, depending on what’s available in the cabinet!). it gives it a little crunch, and tastes better than from a bakery! Love your posts. How do you stay so thin?!! How long did you ajust time for muffins? I did 18 minutes and they came out perfect! What temperature and for how much time to make this into muffins? You should never apologize for banana bread! I never can turn down a slice. Love the addition of sour cream or yogurt! Well heck, my husband is a banana bread FREAK so now I have to try this recipe! Sometimes there is nuthin’ like a slice of good banana bread. I love banana bread. This loaf does look so moist. You can never have enough banana bread. If it is best banana bread ever I need to try it! Yowza! Made this yesterday into mini loaves. Substituted melted coconut oil for the butter and used non fat vanilla greek yogurt. Let’s just say that an entire loaf was gone within minutes that may or may not have included only me partaking. YUMMY!! Tried it with coconut oil too and it was so good. My husband said this was the best banana bread he’s ever had. Thanks Lori- I’m so glad you guys liked it! How much Coconut oil did you use in this recipe and did you melt before using it in this banana bread recipe? How did you adjust time and temp for a mini loaf? Made this today and it was delicious. Mine however, overflowed. Double checked that I used the right ingredients, the right measurements and that the pan was the correct size. Any thoughts? It was also VERY moist. My bananas were ‘very’ ripe which gave it a wonderful banana flavor which sometimes gets lost in other recipes. I did add nuts. Mine overflows too. Maybe its supposed to be 2 pans. Can’t wait to make this tonight! If I want to add chocolate chips, how much would you suggest? Thanks! It’s in the oven now. I’ll let you know how it turns out! I only had 2 bananas, but it hasn’t been out of the oven for two hours and is 3/4’s gone! Delicious and with my Kitchen Aide, a breeze to make. Definitely a keeper. Audra- I took two loaves of this delicious banana bread to work today at 2:30 and it had disappeared by 5:30 to raves and many requests for the recipe. Of course, I directed them to your website. I will be making this again-it was a great success. Thanks! I just made this it is delicious! I did make a few substitutions based on what I had around. I used Whole Wheat Flour instead and Coconut Oil instead of butter and about 1/4 tsp almond extract because I didn’t have enough Valilla!!! Wow thanks so much . This would maked great gifts! I made this recipe today and wow! This is the best banana bread I’ve ever had!! Didn’t change the recipe too much. Used kerrigold butter and added a touch more salt. Came out perfect! Can’t wait to share it with my coworkers tomorrow… Assuming there is still some left! Thanks for posting!! here’s hoping my hubby will love it as much a I do. I did change it alittle. just added another egg and added 2 more banana”s.. yummy yummy yummy!!!!!!! helloooo friend. so i am making this tonight but thinking of browning the butter…….hmmmmm i wonder what you would think and if you were awake i would ask you directly! ha ha ha! i need to provide snacks to tristan’s second grade class ALL week! arughhhhhr!!! thank god for your blog! cookies yesterday. these tomorrow and who knows what the next few days. i’ll let you know how brown butter is for this. i only wonder if ratio is the same when you brown butter (and double recipe) would it still just be two sticks or do you need more? also tried hurrying up my bananas by putting them in a 300 degree oven. wonder how that will be too. I think Brown Butter would be great- did you try it? I used this recipe today, beware with electric ovens that you don’t need to do the 60 minute baking time, I would check it at around 40 minutes to be honest, that’s when mine finished. Also, not sure if it was my baking soda, but mine came out really low, barely rose at all. Maybe adding baking powder would correct this. Otherwise, my fiancee loved the breads! It’s moist and rich in taste :). I added a cup of toasted walnuts to the recipe and they go so well together. It needed 45 minutes of baking for my oven. This looks great! I want to make this soon but have a few quick questions…did you use unsalted or salted butter and light or dark brown sugar? Also, would you suggest any modifications if I’m thinking of adding frozen blueberries? I always use unsalted butter, but either dark or light brown sugar works! I’ve never added frozen blueberries but I’m sure it would work without too much of a problem! I have baked this recipe a ton since you posted it and thought I should let you know as my husband and I love it! I usually make it into regular and/or mini muffins and sometimes add a few chocolate chips. Glad you shared the recipe and I am digging the revamped look of your blog! My Banana Bread Muffins are in the oven now. I am very excited! I am estimating the time for muffins rather than the bread and I’m not sure how long to do it for- wish me luck! you’re not kidding! This recipe is great! I made it into muffins, added mini chips and cinnamon. Thanks!!! so is a stick of butter 4 or 8 ounces? how much ‘should’ I use? 8 oz so 1 cup, is that right? 1 stick of butter (8 tbsp.) is 4 oz. 1/2 cup is 4 ounces (liquid measure), since 1 cup is 8 ounces (liquid measure). People are still raving. Made this several months ago and I keep having people ask me to make it. Home run. Thank you so much for sharing this recipe. I just tried the first slice and loved it. Used white sugar just because didn’t have the brown and put only 1/2 of it. Delicious! Made this a day in advance of serving and it was yummy! I used buttermilk and I baked it in an 8″ cake pan and served it as a snack cake. Next time I will try it with some of the additions I have read in the comments. Blueberries sound great and so do chocolate chips. I have tried many of your recipes and they are consistently excellent! I have some ripe & ready to go bananas…I’ll be making this tonight! yes, it is the best banana recipe I have ever made so far…thanks a lot for sharing. It is moist and soft, very yummy. Thanks Evi I am so glad you like it! A Stick of butter is a half cup or 8 tablespoons or 113g. 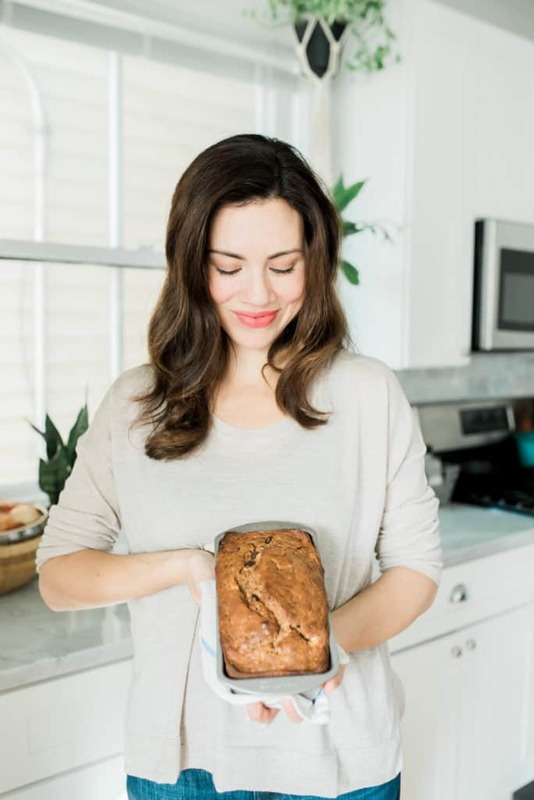 Audra this looks amazing-my wife and I are always talking about making more banana bread, I can’t wait to show her this recipe. Thanks so much!! Tried this recipe today and it was ok but not sweet enough for my taste so I may tweek the sugar next time. I took it out after 1 hour and it was completely raw in the middle. One hour and 15 minutes did the trick. Also, I could not get it out of the pan despite greasing well. How long do you cool it before removing? A large portion of my bottom broke off after cooling for 20 minutes. I usually let it cool completely before flipping the pan. I’d say an hour minimum. Yeah cooking time is tricky because all ovens are different- I’m glad the extra 15 minutes did the trick! This is hands down the best banana bread I have ever made! For as long as I can recall I made an old school recipe of my grandmothers. I loved it but….sorry Nanny…this recipe far surpasses! My kids are addicted to its moist, fluffy texture and OMG it is good! Thanks for sharing! My family and I LOVE this recipe!! 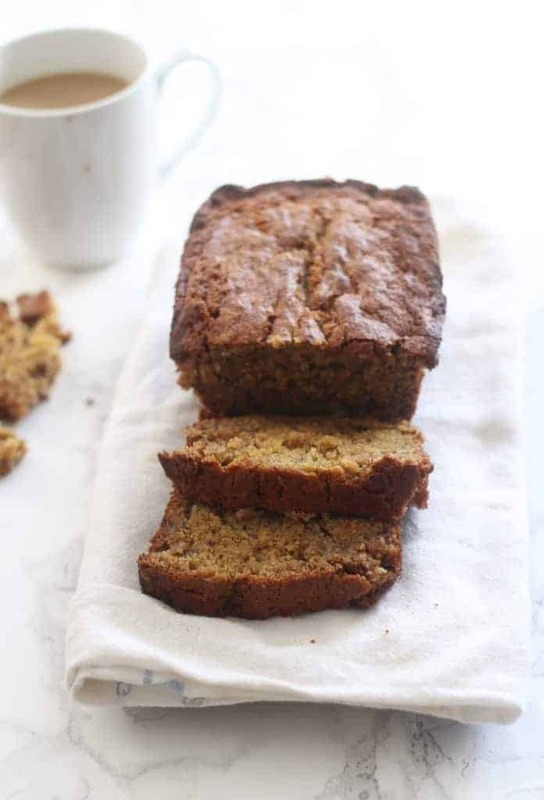 Simply the best banana bread….EVER!!! Thank you so much for sharing your recipe it was simple and delicious. Do you ever add nuts? Also, I usually do half wheat and half white flour. Have you ever tried that. I’m making mini-loaves for my sons for Christmas. Hello I know this is probably a silly question but how many grams is in a stick of butter? Things are slightly different in Australia. Thanks! Hi to make it dairy free can you leave out the sour cream? I wouldn’t suggest skipping it, but you could definitely use a dairy free substitute. Maybe make buttermilk by mixing a tablespoon of lemon juice or vinegar into coconut milk? Hi! When you say melted butter, do you mean really melted? As in microwave the butter so that it’s liquid form? Just want to confirm as usually you would cream together the butter at room temperature with the sugars but if this is one of the secrets to your banana bread that’s very interesting! Isn’t the “creaming” method of the butter and sugars important to help make it fluffy? :) :) thank you! I made this banana bread this afternoon and it was delicious and moist, as promised. Family loved it. One thing though – might I gently suggest you amend the ingredient list to read “1/2 cup butter (1 stick)” or something similar? The reason is because in Canada, butter is sold in large blocks, not sticks like in the U.S. I had melted almost 1 cup of butter before realizing my mistake. I think if it said “1/2 cup”, it would help those of us who do not live in the States. Many thanks. This is my absolute favourite banana bread. I’ve added chocolate chips and or walnuts. My go to fav! And I’m always asked for the recipe. Amazing Audra! Made this the other day, and it WAS the best banana bread I’ve ever made. Usually they come out heavy and gummy inside, but this was delicious and the consistency was perfect. I did add 1/2 cup of toasted pecans because my husband and I like nuts, and it added a nice crunch. He ate almost half the bread at once! 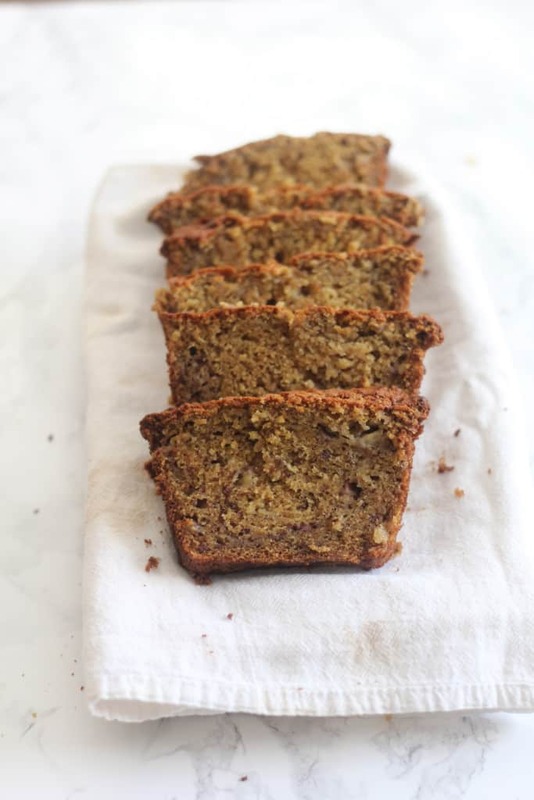 Thanks for this great recipe – it’s a keeper, and will be my go-to banana bread recipe whenever I’ve got leftover bananas! This is delicious! I made it with all-purpose gluten-free flour substituted in the same amount and it worked great! Finally the perfect banana bread recipe! I followed it exactly, just added some pecans which I love and can’t believe how moist and yummy it is. Tossing all my other recipes. Thank you! I’m about to try your recipe out and was wondering if have you tried doubling this so that it makes two loafs instead of one? I LOVED this recipe thanks so much!!!!!! Just want to verify that you do not use any baking powder. Some recipes use both baking soda and baking powder. Want to make this for a friend so I don’t want to mess it up! Can I use a cup of white sugar, instead of half white and half brown? Looking forward to baking this cuz i have exactly 3 ripe bananas …. This is wonderful banana bread and a very easy and quick recipe. The brown sugar and sour cream really make this bread special. For those asking if they can make it with only white sugar, of course you can and it will be good banana bread, but what makes THIS recipe better than others is the brown sugar! This was the best I have ever eaten.. So moist and very simple! I used Cottage Cheese instead of Sour Cream,and didn’t add vanilla because I dint have any of that either …and it turned out Amazing ! Ok…It WAS the best banana bread I have ever made! That is what I googled…that was what I got! Did not change anything but added chopped pecans I just shelled myself.YUM! This is my keeper banana bread recipe going forward. Will have to see what hubby thinks…if I save him any! A novice question, but hey, I’m a novice baker and my first time at banana bread! When you say “fold in the bananas and sour cream”, what does this mean? I’m guessing that I just roll some of the mixture over the banana/sour cream and not mix in thoroughly. Is this correct? Yep! That is absolutely right! This recipe is divine as written, but my favorite variation includes a sprinkle of chopped, toasted pecans and two drops of cardamom essential oil (=2 pods=0.5 tsp ground). I suspect the reviewer whose loaf took only 40 minutes to cook used a convection setting; my convection oven takes about 45 minutes. 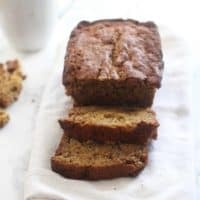 This is definitely the best banana bread recipe I’ve ever tried.. My loafs have never turned out so perfect before:) I used plain organic yogurt and it tastes phenomenal. Adding to my recipe book:) thank you!! Three mashed bananas measure about 1 cup? I have some very ripe ones and was thinking they might be enough. I just made this and it is the best banana bread have ever made. This will be my banana recipe from now on. I used plain greek yogurt. One thing I should have done is smoosh the bananas a little bit more than what I did because the bananas were a little too chunky but that was my fault. I made this recipe today for the first time and it is fabulous! I have had a recipe for years that used vegetable oil and it was good, but this one is far superior with the butter. It is so moist and light. I used 3 mini pans for the fun of it, since the holidays are coming up. Thank you for such a great recipe and so easy! This is delicious banana bread and will be my “go to” recipe. I was looking for a recipe that would make the bread moist and this one does! I used the Greek yogurt, added chopped pecans, and sprinkled a little sugar on top. Best banana bread ever! Absolutely decadent!!! Been using what I thought was the best recipe ever, for years but yours killed it. Added pecans and WHITE chocolate chips to the batter and a mixture of brown sugar & cinnamon, which I sprinkled on the top, for that crunch factor….divine…thank you so much!!!! I made this tonight – SO good. I swapped molasses for vanilla but otherwise followed exactly. So gorgeous and perfect. Thanks! I made this today & it’ll now be my go-to! I’m so glad you decided to share this recipe! I’ve made a whole lot of banana breads in my time, including my grandmother’s recipe. This is REALLY the best I’ve ever had! Incredible! I’m not a big blog-follower, but I’ve found that I your recipes are all spot on delicious! Great job! Hi Audra. Love the recipe! The first time I made them (muffins) they came out perfect. The second time they collapsed in the center a little. I did everything the same, best to my recollection. Have any ideas as to why? Thank you! Loved this recipe as is. Its perfectly moist and tasty. I made this banana bread yesterday, but I had some difficulties when it came to baking it. The bread was in the oven for an hour, but the inside was still very moist and clearly not done. The problem was the the outside of the bread started to burn. How could I avoid this? Cooking it for a longer time at a lower temperature maybe? I had this same issue. Did you happen to try it again? Wondering how it turned out. I had the same problem. I covered it with foil and cooked another 20 mins to prevent burning. The top didn’t burn, but the bottom did. And it was still overly moist in the center. I think this recipe might be better for muffins than loaxes. I make this as a loaf 1/2x a week! Chances are your oven needs to be calibrated and runs hot. I’d get an oven thermometer to check! I love this recipe. I’ve made it 3 times already – each time it comes out perfectly even though I’ve played with the sugar quantity and done some of the milk/yogurt/etc. substitutions. One addition I’ve made, and I stole this from another recipe, is to add the zest of a small orange (I suppose you could do a lemon too). The citrus tartness really makes me smile with every slice. Thank you for thus recipe. Amazing. I cooked it in muffin tins, made 18. I have used many banana bread recipes and this one really is the best. For those of us that live in Australia can you please tell me how much a stick of butter weighs? The Bread is great, the sour cream leaves it very moist. I would mix the banana and sour cream into the mix with the butter sugar etc, then whisk the dry ingredients together and fold in so minimize making it get more dense. Half cup or so of chopped pecans is also a nice addition if you like nuts in your bread. Thanks for recipe. I made this the other day in a convention mini oven used a metal square pan, not the rectangle ones, like the ones that fill almost the whole oven and it came out amazing. I put a twist and out a 1/2 teaspoon of cinnamon in the batter before adding the bananas and also added another half to the 3. I don’t use fresh ones, really really ripe was the best, but I took it to work and everyone loved it. I’ve made a lot of banana bread before but not this good, I was telling people, you never had banana bread like this before baby, I put my foot in it! Lol it was awesome! Thank you for sharing! Love this recipe! This recipe definitely deserves the title “Best Banana Bread Ever”. This is ridiculously delicious. I’ve made this like four times after coming across your recipe and I haven’t eaten banan bread in years. I just put this in my cookbook:) It’s now my go to recipe. Thanks so much for sharing! Wow this is amazing! I added walnuts and it turned out great. It is a recipe I will come back to for a very long time. Thank you!! Wow! I just re-read the recipe and realized I did something wrong, I used baking powder instead of baking soda! It looks and tastes delicious please explain the function of each? I am baking this right now. I am so excited to try it. I used coconut oil spray to grease an 8×8 glass baking dish. Then I altered the recipe a bit and added macadamia nuts and a layer of dark chocolate squares in the center. Also, I did not have white sugar so I used coconut sugar and brown sugar mix. Stay tuned……. Greetings from Nigeria. My first attempt today at banana bread and it turned out fantastic. I won’t try another recipe. I doubled the recipe for two pans and mixed in 2 handfuls of peanuts in one pan and left the other without the peanuts. Both were perfect. Delicious with lovely texture. Little wonder the recipe has got so many positive reviews. This recipe is a keeper. I used substitute for buttermilk(milk+vinegar) as I had no buttermilk, sourcream or yoghurt at home. Can’t wait to try this out with some coconut flakes for added texture. Thank you so much for sharing. I look forward to trying out out some of your other recipes as I just discovered your site. The loaf is super moist and so fluffy! The sour cream makes all the difference in my opinion! Made this banana bread this afternoon. Hubby loves banana bread. Me not much. Hubby claimed that he was so stuff from dinner that he could not possibly have a slice. After he took bite. He all of a sudden had room for 2 slices. I ate3 slices after dinner. That tells you something. Thank you so much for the recipe. Hubby said it’s the best he has ever had. I have tried o so many banana bread recipes through the years, but this one is the best by far!!!! I was prepared for yet another dry, flavorless bread, but WOW was I wrong! So delicious!!! Will not use any other recipe again!!! Thanks for sharing!! Love this recipe! So moist and really delicious. My only addition is chopped pecans. Down in Texas you can’t have banana bread without pecans in it. Made this recipe over the weekend, and yup, it is definitely the best banana bread I’ve ever had. Several people have now asked me for the recipe, so I’m passing it on. Just made this. By far the best I have made. So moist and absolutely delicious. I added chopped walnuts to mine. Definitely making this again. I used coconut palm sugar and because I only had two bananas, I added about 1/4 cup of flax seeds. It turned out beautifully! Thanks for the recipe! I’ve been looking for a good banana bread recipe for over a year and every time I’m disappointed. Stumbled upon this recipe and wow!!! Finally a good one I’m definitely gonna keep! It is the best banana bread I’ve ever had! Thank you thank you! This was SO good! I added in mini chocolate chips and it was the best! This truly is the best banana bread ever! I’ve already made this three times since finding the recipe a month ago and my whole family loves it. Could you give a variation for pumpkin bread? I was thinking just sub out the bananas for 2 cups pumpkin? More? Less? And add 2 teaspoons pumpkin pie spice? I’m not much one to vary baking recipes so I was hoping you could help. Thank you! This IS the best banana bread recipe I have been able to find and I have been looking for such a long time! I won’t have to look any longer. This is exactly what I was looking for…a nicely dense, not so cake-like, extremely moist loaf with excellent banana flavor. Thank you so much for sharing this! Hi! I gotta say this is the BEST Banana bread I’ve ever had. I love Banana bread and this was actually the first time I bake one. Used this recipe and it was the best one I could ever found!!! it all started when I noticed 3 riped bananas that I didnt want to throw away… Lol. It’s so moist and sweet… I will make it so often!Thank you for sharing this recipe! This recipe is the best banana bread recipe I’ve ever tried. Hands down! Thank you for sharing such an amazing recipe! My friends and family are all asking me to make more. It’s a huge winner! I made mine with sour cream. I’m going to try the Greek yogurt next. Mine is in the oven now. It’s been baking for 20 minutes. Needs probably ten more. It spilled over on sides of bread pan and is super flat on top. Is that normal. I’m baking at 350 degrees. It usually needs 50-60 minutes. If it’s spilling over I’m guessing you’re using an 8 inch loaf pan instead of 9 inch? Oh yes they are old vintage pans so probably 8 inch. Also I misread the recipe and was going by the 8 by 8 pan time. Figured it out and my family loved this bread! Thank you for sharing it’s, great! I can’t wait to try this. Could you please give us a cup measure for the bananas? I’ll admit I want this to convert to pumpkin bread bread, but only after making the original banana bread. Love your recipes! This is a great base recipe. On its on its very moist… but bland. When I made this I doubled the vanilla and added a 2 teaspoons of nutmeg, tablespoon of cinnamon, and cup of walnuts. I sprinkled sugar on top. It turned out pretty good. I would just add 1/3 cup of brown sugar in the mixture. (We have a sweet tooth) In all this came out great for my first bread recipe. This recipe is a keeper thank you. Hi Michele, did you end up trying this? 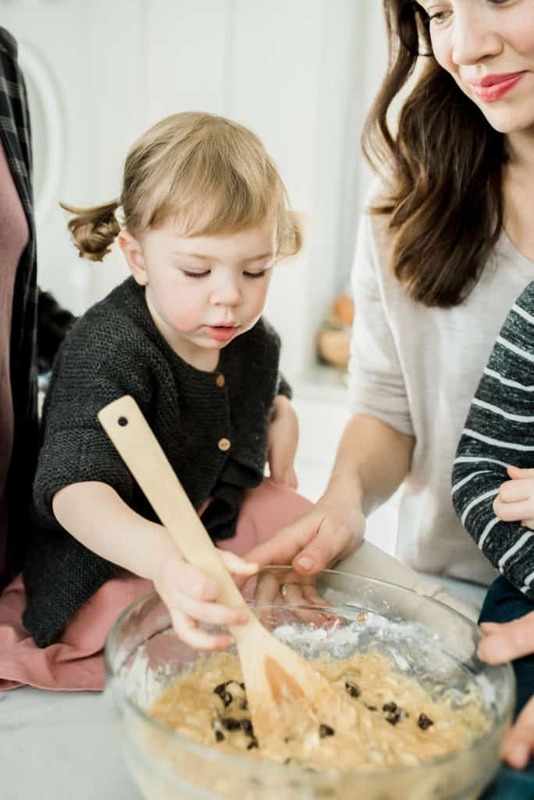 I’m also wondering about substituting applesauce – would love to know how it turned out! Absolutely simple, delicious and moist! I used an 11×7 glass dish and baked for 37 minutes. I added 1/2 cup of walnuts and 1/2 cup chocolate chips. It is so light and airy. Only 15 minutes out of the oven and it is halfway gone! This will be our new go to snack cake. Thank you for sharing a no fail recipe! If I have lots of overripe bananas, I simmer them in a pot (a la Cook’s Illustrated) to reduce some of the liquid & intensify the banana flavour….and use up more bananas:) This is now my go-to recipe for Banana Bread. I have tried many different banana bread recipes. None were quite was I was looking for. Until now. I mistakenly used Baking powder in place of baking soda and I’m happy I did. I prefer banana bread to be moist and dense. Heavy for it’s size. I would have had to double the amount of baking powder to get the same lift as baking soda. That mistake gave the bread less rise. The flavor and texture was spot on. Walnuts are also a must for me. I’m keeping this recipe for life. I may try it with baking soda, but use less. My husband found your recipe and asked me to try it instead of the one I always made. So i tried it with the Greek yogurt. It was wonderful! Then he said to me a week later that he had more bananas that were over ripe (I think he got some and hid them so they could ripen) and said that since we have Blueberries that were getting a little soft I should add them. I used your Banana Bread recipe the last time I made them. Perfecto! I used thawed frozen bananas and doubled the recipe. Freezing I think brings out the banana oils more, plus they were very very ripe too before freezing. I have some more frozen in the freezer so that’s my plan for the day. I also opted to use buttermilk in place of sour cream since I usually keep that on had for cooking. I am anxious to check out your other Dessert Bread Recipes. I tried this Banana bread recipe and it came out delicious and really moist. It smelled amazing and was an absolute treat, warm straight out of the oven. I adapted the recipe a little bit. I used flavourless oil instead of butter, and substituted 1/2 cup of cocoa powder instead of equal quantity of plain flour. I really loved the final products!! Thanks a lot for this amazing recipe!! 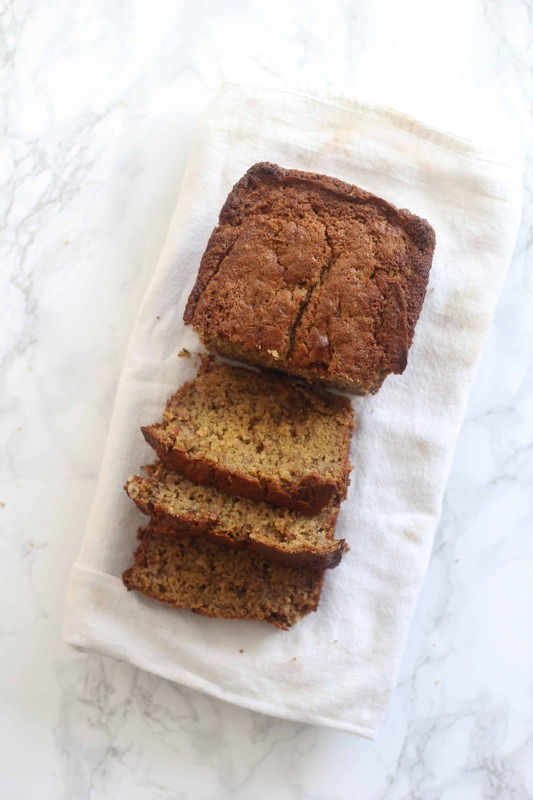 This is my new go-to Banana Bread recipe — it’s fabulous! I add a handful of mini chocolate chips and a handful of chopped walnuts to mine. So moist, and I love the banana globs (for lack of a better word) due to hand-mixing only instead of using an electric mixer. Thanks, Baker Chick! Sounds like your oven needs to be calibrated. Considering the hundred+ comments raving about the recipe the problem is likely something you did. Sorry it didn’t turn out! I’ve been searching for two decades for a banana bread recipe that rivals the best ones I’ve eaten in the Caribbean and South Pacific, to no avail. That is, until now!! THIS IS PERFECT. Dense, buttery, so delectable! I used overly ripe bananas that had been frozen, added pecans and raisins, and doubled the vanilla. I think the sour cream made all the difference in moistness and flavour. Peanut butter icing topped it off to make for an exquisite brunch item that everyone raved about. One loaf lasted one sitting. Thank you for sharing! I never leave a comment on recipes, but this was so good I had to! The sour cream was the perfect touch to make this even more moist and detectable. I added a cup of chopped walnuts and a little more vanilla. This was the best banana bread I have ever made and it was so easy! Thanks for such a wonderful recipe! I never leave a comment on recipes, but this was so good I had to! The sour cream was the perfect touch to make this even more moist and delicious. I added a cup of chopped walnuts and a little more vanilla. This was the best banana bread I have ever made and it was so easy! Thanks for such a wonderful recipe! So good I couldn’t stop eating it! Perfect as-is, added chocolate chips. Next time I will try the citrus zest suggested by another reviewer. Thank you!! I know there are already a million comments, but I loved this banana bread too :) Making it again this morning and thought I’d comment! Added 3/4 cup walnuts and thought about adding cinnamon, but decided that it doesn’t need it. Beautiful blog as well, love your photographs!! Made a double batch of this yesterday for a school treat (used 2 cups whole wheat flour and 1 cup all purpose to amp up the fiber!). Cut the sugar a little and added 80% chocolate chips. There wasn’t a single slice left so we are having to make more today! I made one loaf in the loaf pan and one in a nine inch round tin and both came out great! thank you! This is now my favorite banana bread!! I followed the instructions except for adding 1/2 tsp nutmeg for each loaf. ( I doubled the recipe) I used two 8″ and 1 mini loaf pan. No run over, but it took an extra 10 mins to bake the 8″ pans. Once cooled, I sliced the bread before taking the loaves out of the pans. I then cut down wax paper pieces and placed between each slice. This keeps slices from sticking together when they are frozen. I removed each loaf from the pan and placed each in a freezer bag. Perfect for grabbing a single piece for a yummy snack. Hey, this recipe is awesome! I tweaked it to make a Paleo(ish) version of the bread, and it came out beautifully. I subbed Bob’s Red Mill Paleo Flour for regular (same proportions) and used E-Sugar and Coconut sugar in place of the white and browns (I do realize that doesn’t actually qualify the resulting bread as paleo, but it’s lower in carbs, which was really our goal). Added some warm spices, since we are in love with spice breads, and ta-da! Amazing! It was so delicious! I almost always have to make multiple iterations of my experimental lower-carb breads and baked goodies, but this one was a keeper right out of the gate. Thanks for sharing this! I also use Siggis Icelandic Skyr in place of the greek yogurt/sour cream, I’ll use whatever I have on hand, vanilla, plain.. I can’t wait to make these. I think I will put it in muffin pans for the kids for easy breakfast or snack. Thank you for sharing!! I have made this recipe countless times, and given it to friends. It truly is the best ever. I usually add walnuts and chocolate chips, and have subbed hard red wheat flour for some of the AP. I also always use greek yoghurt. Hi, this recipe truly is the most amazing banana bread recipe ever. It is simple and delicious. I tried out this recipe on my blog and it was a hit with everyone at home. It made for a good teatime treat! Just came out of the oven – got my vote! This is a GREAT recipe. I couldn’t find my loaf bans, must’ve let someone borrow them at some point. I ended up making cupcakes and they are delicious. 18 minutes at 350. Yum! 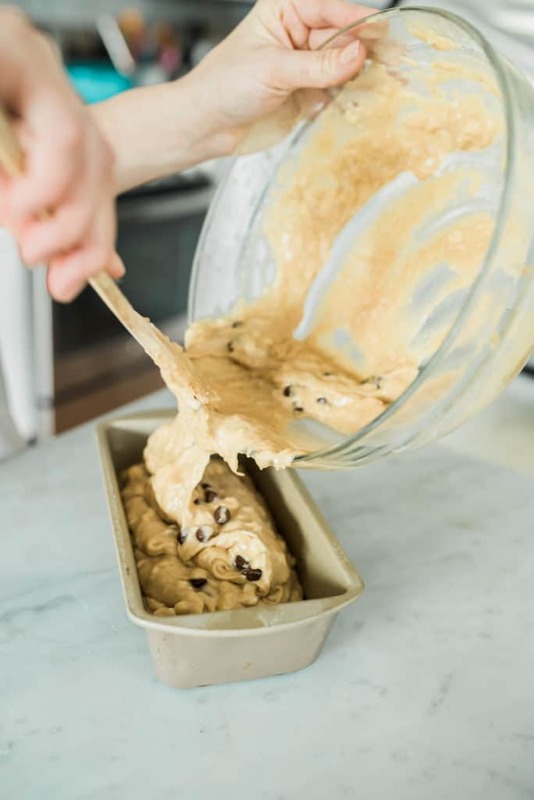 I have been baking without help since I was 10 years old and have made zillions of banana bread recipes.. That is 54 years of banana breads, not to tell you how old I am, LOL. This IS THE BEST banana bread ever! No lie. The addition of your cream/Greek yogurt makes it so moist. I found your recipe when I had to use up some sour cream that I got for free and never buy. I always buy plain Greek yogurt. Have made it both ways with great success. I also always add cinnamon, 1 tsp. or whatever mood I am in per loaf. Sometimes sprinkle chocolate chips on top. Anyway you slice it, my go-to recipe for banana bread. The BEST EVER, and I never write reviews. Thank you for posting the recipe, you have changed my life!